Posted 08-12-2014 by timstanfield & filed under Market Statistics. Here is what’s selling at what price range compared to last year: Big spike upwards all the way from $400k – $1M. Things are picking up thats for sure! Central Zone (Peachland to Lake Country): During July, overall sales in the Central Zone were up 24.0% — to 584 units from 471 in 2013. Total residential sales for the month improved 25.7% to 543 units compared to 432 last year at this time. 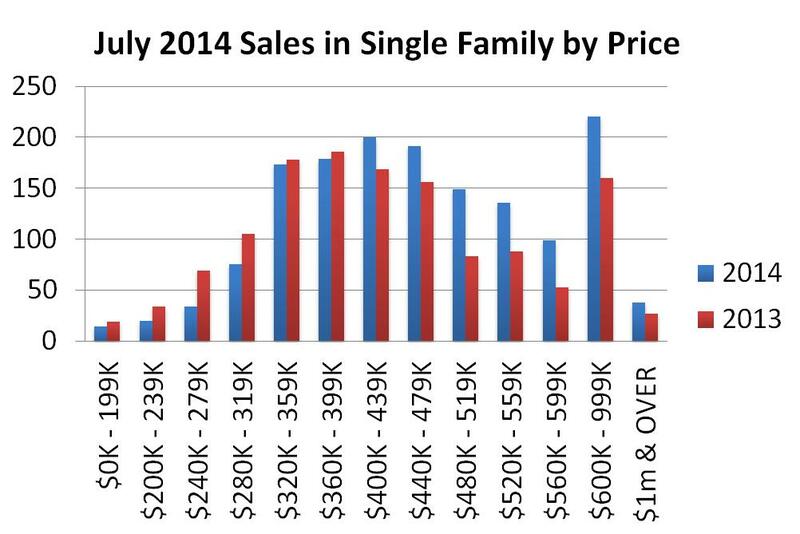 The sale of single family homes was up 26.2% over July 2013 (to 279 from 221). The 937 new listings taken in the Central Okanagan during the month saw a 2.4% rise compared to 915 in 2013, and total inventory was reduced by 13.9% to 3.969 units from 4,611 last July. In summary, there are almost 26% more homes selling this year and more NEW listings but overall the inventory is almost 14% less than last year. It is always wise to consult a professional REALTOR(R) when seeking information on home statistics – we live in an ever-changing marketplace so it is very important to keep up to date. If you have any questions please do not hesitate to contact me at 778-214-1773.